This is an exact reproduction of the Original Winnie-the-Pooh published in 1926. Winnie-the-Pooh is perhaps unique in that it is based on real people and historical events. Christopher Robin was a real person. As a child, he had a teddy bear he named "Winnie-the-Pooh". The bear was named after a real bear in the London Zoo named Winnie. The introductory chapter in the book "Winnie-the-Pooh" explains haw the teddy bear got his name. The stories later in the book are fiction, but the beginning introduction to the book is factual. Because this book is about real people and events, this places the book in a different legal position than other children's books with cartoon characters such as Mickey Mouse and Donald Duck which are purely the inventions of their creators. The real Winnie-the-Pooh is now on display at the New York Public Library. 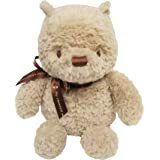 Disney Baby Classic Pooh Stuffed Animal, 11.75"
possible, but am grateful to everyone who helped to make it happen. Thank you. 171 people found this helpful. This is a lovely keepsake-quality book with all the illustrations those of previous generations remember with affection. 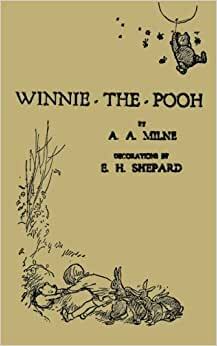 I was disappointed, however, to find these "complete tales" did not include the teddy bear poems from Milne's "When We Were Very Young", my own introduction to Pooh over 80 years ago. 70 people found this helpful. I bought this sweet book for myself, because I am simply smitten with the gentleness and kindness that is so commonly illustrated in its pages. I know it is supposed to be for children, but there is plenty for adults to learn, if they care to. I love this book! It is a great story and book for children. Unfortunately the book presented for sale is not what you receive. The book for sale is a special addition that is printed in the USA. The one you receive is not the special addition and it is printed in China. The ad and preview for this book is misleading. 206 people found this helpful.